A few weeks ago I was invited to an artists' residence called The Emely Post at Frances Bardsley School for Girls in Romford, on the outskirts of London. Two artists, Rosalie Schweiker and Denise Hickey, have created the most extraordinary postal den. It's brilliant. Students go to tinker with old typewriters, put messages in bottles or simply leave notes for friends in pigeon holes. 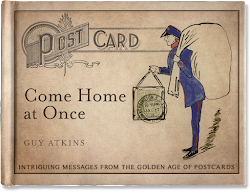 Over lunch, a group of us (some students, Denise and I) discussed how Edwardians used postcards. We each read out the message on an old postcard. Then chatted about the stories that lay behind the cards and how the way we communicate has changed over time. Next, looking at the messages as a whole, we identified some of the techniques the Edwardians used when writing postcards. think about how you can relate the message on the back to the picture on the front. Finally, we put these techniques to work by replying to some of the cards we'd read out. Exhausting stuff... but great fun. Thanks go to the girls, and to Denise and Rosalie... and good luck with future projects! I'm giving a talk on postcard messages at Clerkenwell Design Week for the British Postal Museum & Archive on Thursday 26 May. If you'd like to come along, please do. It's going to take place at 7pm at the Phoenix Centre in Farringdon, London. If you want to reserve a ticket call 020 7239 2570 or email info@postalheritage.org.uk to book. For more details click here.